Same image posted of modern multiple layer tongue and groove laminate. over the cheaper single layer thin click together sheets. This stuff is a bit more expensive but has a sound proof membrane and cushion foam layer all built into it - good stuff and great selection of colors and patterns. We just had a Cortec floor installed and it looks great. It’s waterproof and durable. I highly recommend checking it out, although I don’t think it’s sld at the big chain stores. thoughts on vinyl wood tiles? they look nice but do they get damaged easily? I read someplace that one should not put heavy items on them, but I saw some at HD at they seem sturdy. thoughts. 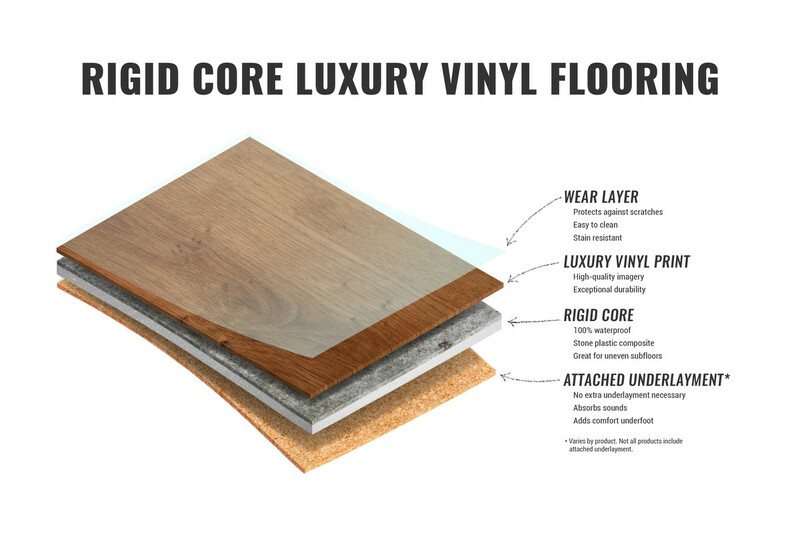 I found the laminate floors end up look cheap as well but maybe with the newer more durable types that is not case, the attached image shows the different materials in the layering system and the variety of colors is very good. 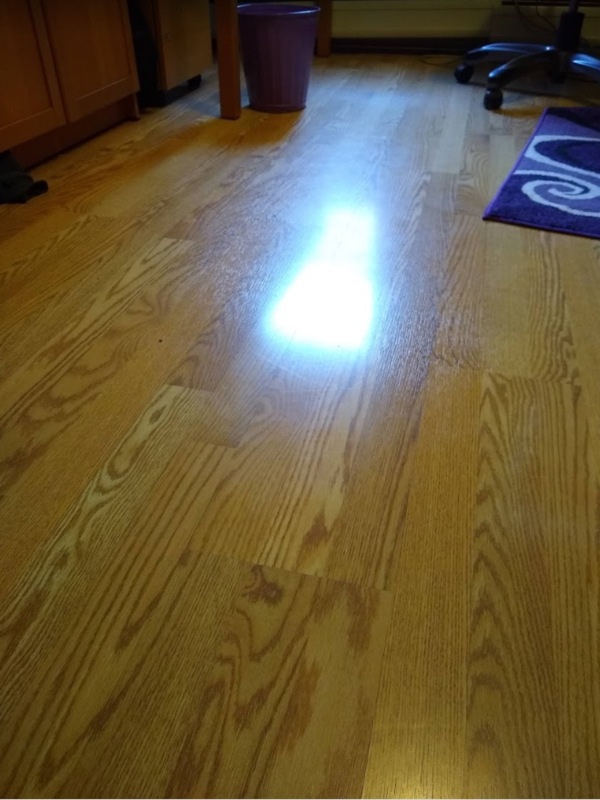 Hardwood floors are what I am going over, they are great but have a lifespan after being refinished a few times although they are original to this apartment that is close to 100 years old and that is not too shabby of a return on investment. I'm not sure what anyone is referring to when they say "looks cheap". There's a lot of variables, like thickness, texture, and just how good a picture of wood is printed on the board. I laid this floor below in 2002 for my 3 year old son. It's still nearly perfect, and that floor had a dramatic dip in the middle where the 5/4 subfloor had apparently been scraped multiple times down to the tongue of the planks. If it's a valuable home and you like hardwood, but it's beyond another resanding, why not just replace the hardwood? I have a friend who bought a craftsman style house about 15 years ago. he put down laminate and now they look cheap. he keeps talking about painting in order to make the place look nicer. I told him that no amount of painting is going to overcome the problem of his floors. I told him to look into porcelain that looks like wood, or even engineered wood floors. Where you can't go under existing molding, how are you trapping the edges? Just running clamshell molding over it ? 1/4 round molding. I prefer 5/8, since it give more room for error as the flooring shifts. Most directions say to leave at least 1/4" from the wall, at least for the wood fiber based product. I'm not familiar with the product you're showing, but it's possible it can be cut and snapped with a box cutter like the 5mm planks I'm working with, rather than needing a saw. Check the directions. Looks nice but very pricey, the 5mm planks from Lumber Liquidators I'm currently installing are half that. I'd buy it if I was replacing 8mm laminate, so the molding undercuts matched. with a rubber or cork type base - looks quite good actually. What are you cutting the panels with when needing to made edges or openings say for radiator legs? The stuff I looked at advertised a 20 year lifespan and the hard top surface has me wondering how to get clean cuts. It's not hard to cut but the silica heavy coating destroys blades quickly. I have a table rig for my hand jigsaw that makes it like a little tablesaw. Jigsaw blades are much cheaper than carbide circular saw blades, and you'd need it anyway for cutting details. There trickiest part of laying this stuff is scribing it to the uneven walls in these old houses and getting it under the moldings you undercut with an oscillating saw. I haven't seen where laminate buckles, but after awhile they start to swell at the ends and end up looking cheap. that has been my experience. Are you talking about water damage, or that slight lifting of the edge where they meet if there's no bevel? I think that comes from the flexing of the planks sinking slightly into the foam underlayment. I've started buying the type with the small bevel for exactly that reason, and I'm sure that's why it was developed. The way you can get buckling is installing it too tight in cool dry weather like now, and then it expands in summer. I have heard many positive things about COREtec. The tongue and groove floating systems I find can buckle and not particularly overly durable unless adhesive is used underneath them. That's not been my experience with thousands of feet of the locking planks, but I don't use thinner than 8mm. Whatever. What base layer are you adhering the tiles to? If you're addressing me, the products I'm using all float. That way you can pull it up and replace a plank if it comes to that. The subfloor can be quite bad and it will still be fine. For what you linked or what's commonly called 'linoleum tile' AKA vinyl composition tile or VCT, that needs a perfect subfloor to glue down to. I'd NEVER do the peel and stick, been there done that. Comes up. Try looking at Luxury Vinyl Tile. It has better wear and water resistance than laminate, doesn't crack, has a lot of different patterns and styles, and is not very expensive. I've been using the click type 5mm LVP in kitchens and am currently laying it in a stairwell. It's pretty good, but I find it much harder to lay than standard 8-10mm laminate, of which I've laid thousands of feet. Most of which is doing fine, even my son's room which survived him from 3 to off to college. Water is the real enemy of laminate, but there's some new products advertised as more resistant. Costco, where I've bought the most, has a product saying it can resist spills for 24 hrs. Plus it's around $1.30/ft. What is the most durable type flooring that can placed in an apartment. Not ceramic tiles that crack, hardwood flooring is ok but scratches and needs resurfacing. Laminate flooring ends up wearing and peeling after time. So apart from laying down sheets of diamond plate what works best?